We have Just Sold out of Avengers Titan Hero B 12 Inch Action Figures Wave 1 Case. Not to Worry! Fill in the Notify me When Available and you will be the first in line for our restock of Avengers Titan Hero B 12 Inch Action Figures Wave 1 Case !! From the The Avengers 2 Age of Ultron collection by Hasbro. Avengers Titan Hero B 12 Inch Action Figures Wave 1 Case. The Avengers Titan Hero B 12 Inch Action Figures Wave 1 Case includes- 3 MARVEL AVENGERS FALCON - 2 AVENGERS WINTER SOLDIER - 2 MARVELS AVENGERS VISION - 1 AVENGERS BLACK WIDOW. Each action figure measures approximately 12 inches tall and has 5 points of articulation. 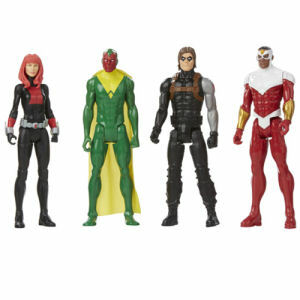 Hasbro Avengers Action Figures shipping from Canada. No Surprise Border fees or Customs!